Saber2th looks at his watch, then uses his best Army roll call voice in reply: “At least three ‘Crazy Trains!’” We cannot hear our own laughter. There’s a quirky protocol when it comes to buddies who are back in the states on military leave. First off, you don’t call them–they call you. They only have a few precious days here to spend, after all, and wives, kids, dogs, and home repairs are all higher on the food chain than Army buddies. If and when they call, however, you make sure to go. It’s like getting served with a subpoena. Call it a “command performance,” even if they don’t outrank you. “I made sure to have shaving cream for him when he got home,” Saber2th’s wife says, shaking her head. “What was I thinking?” I ask her how long he’s been home, and how long it took for the novelty to wear off. She smiles a tolerant smile. I’ve seen that expression before, in my own home. She tells me later: “I would’ve wanted this leave to happen in March, when we’d have only a few months left,” As it stands right now, however, it’s only halfway through the year-long deployment. The Saber2ths have two younger kids, not yet in kindergarten, the same ages as my own. Managing the kids solo has been a little rough, she says, but having her husband back has been a good reminder of how it’s supposed to be. Mid-tour leave is a blessing and curse, both for individual soldiers and the military units they comprise. In press releases, the local deployment of more than 3,000 citizen-soldiers has been billed as the largest deployment of Iowa National Guard troops since World War II. To make the scale of the endeavor more relatable, I compare it transporting the entire population of Huxley, Iowa halfway across the world, and tasking its denizens—teachers, police officers, pastors, shopkeepers, and farmers—with securing, administering, and rebuilding a foreign country. Notably, Iowa’s 2nd Brigade Combat Team, 34th Infantry “Red Bull” Division is a “battle-space owner,” and its commander is ultimately responsible for everything that happens–security of Afghan civilians, training Afghan soldiers and police–within its assigned territories. These are the Afghan provinces of Parwan, Panjshir, and Laghman, as well as a portion of Nuristan. In square miles, that’s the equivalent land area of 10 or more of Iowa’s 99 counties. Other than that, it’s hard to compare the two terrains. Afghanistan certainly has more mountains than Iowa. There is also more sporadic mortar fire. Planners for the 2-34th BCT deployment worked hard to ensure that Iowans would have enough “boots-on-ground” (“BOG”) time to qualify for mid-tour leave. By current policy, the magic number is 270 days in country. That sounds simple, but it’s not. The number is calculated as a unit, not as individuals. Also, a military unit arrives and departs in waves–not all at once–gradually replacing the preceding or succeeding unit in what is called a Relief in Place (“RIP”) and Transfer of Authority (“TOA.”) The weeks immediately following and leading to a RIP/TOA are blacked out–no soldiers may take mid-tour leave during this time. Finally, in the months in which mid-tour leave is possible, commanders must maintain their in-country numbers at not less than 90 percent strength–to do otherwise would be to degrade a unit’s ability to conduct 24-hour combat operations. Mid-tour leave, in short, can be a headache for everyone. But it beats not having the possibility of going home at all. Every deployed family has a different strategy for taking mid-tour military leave. The personal calculus goes beyond trying to schedule trips near holidays or pregnancy due-dates. One soldier friend recently chose to meet up with his wife in New York City, then absconded with her to some tropical island somewhere. Another says he’ll similarly meet up with his wife and kids at a neutral location–maybe Germany–rather than traveling all the way home. That way, he hopes, the kids won’t feel like he’s ripping the emotional stitches off regarding his year-long absence. One soldier, who is married to another, says his pre-teen kids say they don’t want to see his wife at all during her deployment–only when she gets to come home to stay for good. Or, more realistically, until one of the two parents has to deploy again. Someone hands me a beer in a tall, footed, but not entirely unmanly glass. I don’t catch the description of what I’m about to drink. The beer names here are longer than Wagner’s Ring Cycle, and, other than a little conversational Def Leppard (“Gunter, glieben, glauchen, globen”), I don’t sprechen sie German. Setting my buddy up for a war story, I jokingly ask if the beer is called “schutzenschnur.” I’ve been keeping up with some of his adventures downrange via Facebook, and I know what’s coming. “Hey, that’s German for learning how to shoot some NATO weapons and not hurting yourself!” says Saber2th. “They give you a badge for it and everything!” God love him and the U.S. Cavalry–he’s not entirely joking. I started writing a military blog when I was in uniform myself, and got the same “Roaring Bull” telephone call as had Saber2th, alerting us for deployment to Afghanistan. I started writing because I wanted to be able to document for my infant son and toddler daughter, just what had been so gosh-darn important that I’d miss out on a year of their young lives. Later, a paperwork snafu resulted in dropping me off the list for deployment, and I got retired instead. I’d kept up with writing the blog, however. And I’d publicly committed to my buddies and my former commander that I’d figure out a way to visit them downrange. The plan now is to embed with Iowa’s “Red Bull” as civilian media, sometime in the spring. As proof of my intent, both to myself and to family and friends, I have already purchased my own body armor, along with ceramic plates capable of stopping a few rounds from a machine gun. Some things, however, you can’t ask over e-mail or Facebook. Some things, you can’t get by reading between the lines in the newspapers, or by triangulating the media-blackouts that happen whenever someone on one of the Iowa bases gets wounded or killed. I want to ask Saber2th about the mortars and rockets downrange. I want to find out just what I’m getting myself into. 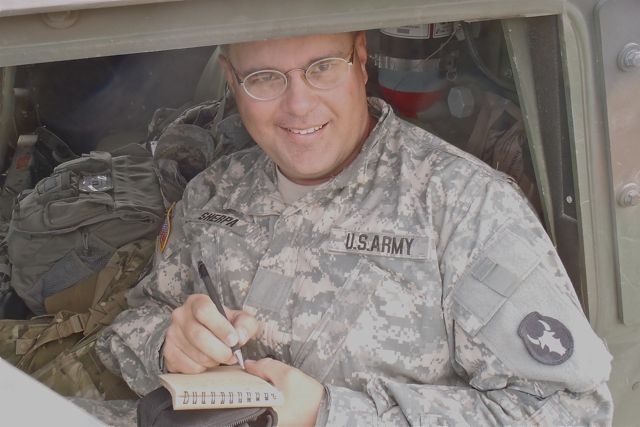 Saber2th works in tactical intelligence, and his unit, Iowa’s 1st Squadron, 133rd Cavalry Regiment (1-133rd Cav. ), is currently responsible for maintaining security surrounding Bagram Airfield (“BAF”) in Parwan Province. Originally built by the Soviets, it is now the largest U.S. and coalition military installation in Afghanistan. Built for 10,000 people, it has in recent years swelled to approximately 35,000. Insurgents reportedly rig timers onto old munitions, such as Chinese-made 107mm rockets, and prop them pointing toward the base, hoping for a random hit. Saberth2th and his crew attempt to predict when and where the attacks will take place. The Iowa cavalry is essentially serving missions similar to their historical horse-mounted ancestors: Patrol the frontier. Chase down the bad guys. Protect the fort. Between beers and bass notes, Saber2th and I do get to talk a little shop, but spousal proximity prohibits sharing too many details. That’s another unwritten rule about mid-tour leave: Don’t talk about Fight Club. At least, not with family within ear-shot. The bar has gotten crowded. Our group ends up sharing a large booth with an assortment of unescorted brunettes, so the single guys in our posse swivel their turrets to start winning hearts and minds and telephone numbers. Instead of shots fired, or shots heard round the world, the night devolves into shots bought round the table. Meanwhile, a hipster sitting in an adjacent booth, wearing a bright orange T-shirt and a beige blazer, starts chatting up the Saber2ths. Turns out, their group is from the local metropolitan opera. “It’s our first night off in 2-and-a-half weeks,” the guy complains. Saber2th rolls his eyes instead of punching the guy. They don’t get weekends off in Afghanistan. The proverbial fat lady never sings there. In just a week or two, he’ll be right back at it, and so will his wife and kids here at home. Tonight, however, it’s a few stolen moments of beers and buddies and brass instruments, of not getting too caught up in the details, and avoiding fisticuffs with opera singers and shield maiden wannabes. Going off the rails on a crazy train.